Comic books and graphic novels typically tell stories using panels, or little boxes, lined up one after the other in a sequence depicting different moments in time. 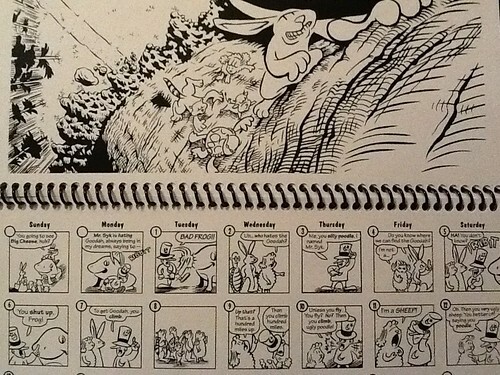 Similarly, most calendars use boxes to visually represent the sequence of days in each month. 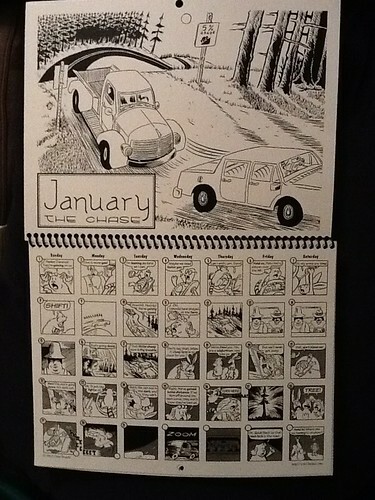 Along comes cartoonist Chris Brandt, who noticed this similarity and ingeniously merged the two into what may be the first calendar comic book. 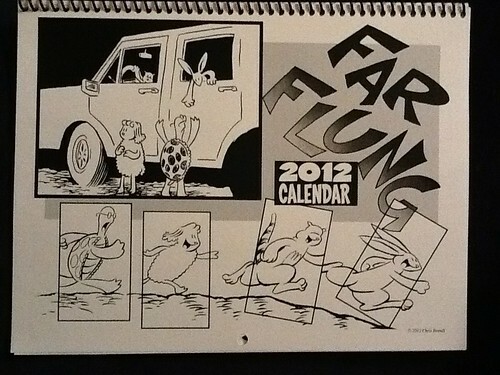 The Far Flung 2012 Calendar uses each month to tell a chapter in a year-long adventure of four cartoon animals. The top image serves as the splash page, and then each day of the month is one panel or moment in that chapter, just like a long comic strip. It’s a fun, funny adventure of a sheep escaping from a farm with the help of a rabbit, turtle and ring-tailed lemur. The quartet steal a car and head off for freedom and cute shenanigans! Originally made as a 2000 calendar with a very limited print run (only 300 copies were made), Chris Brandt updated it for 2012 with an equally limited print run at the insistence of friends. But this time he’s made the calendar available as a free downloadable PDF that anyone can print out and hang on their wall to enjoy for the whole year. More pictures are below, or check out the mini-gallery I made. For more on Chris Brandt, who is also serving as a producer with me on Dig Comics, check out his website Bainst.com.